A semi unusual repair is in the shop. I call it the "Pot Clock". It is a cooking pot with a Junghans time and strike clock movement installed. This clock was located in the customer's kitchen hence, a buildup of kitchen grease was observed on the clock movement. 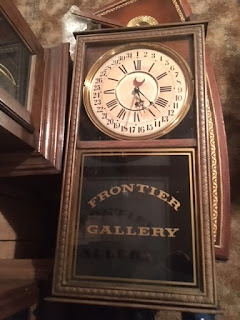 These are the best clocks to restore because the difference between when the clock was dropped off and when it goes back is significantly different. Click this link for a short video on the wear of the pivot holes. There were 14 pivot holes that required rebuilding. 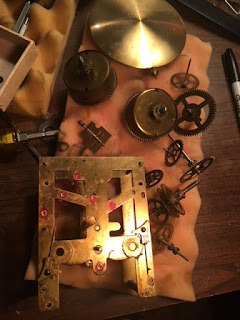 Here we see the movement disassembled and marked. The marking are the warn pivot holes that will be rebuilt. Notice all the old dirt and grease layered on the brass plates and wheels. The next images show the mainspring barrels both before cleaning and after. Here we have a nice Sessions time only calendar clock. The glass has been custom stenciled for the Frontier Gallery in Fort Collins, Colorado. The clock when received was in generally good condition, well taken care of. Here is a picture as it came through the door and before and work was performed: To start the repair, the clock hands and face were removed. The movement was taken out of the case. The case was set aside to be inspected for loose door hinges, wood cracks, etc. The case was oiled and the glass cleaned. This was done during the final phases of the testing of the repaired clock. This clock has a time only movement with a separate gear set to operate the calendar. A very simple movement. There were 5 pivot holes that were worn and needed rebuilding. All pivots were inspected for wear and polished. This next video is a demonstration of the warn pivot holes.